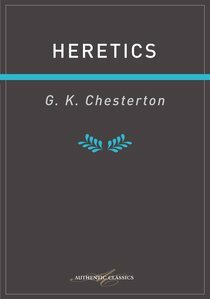 In this 1905 collection of articles Chesterton exposes the faulty thinking underlying popular modern "heresies" such as negativism, relativism, neo-paganism, puritanism, aestheticism, and individualism. The book includes one of his best essays: "On Certain Modern Writers and the Institution of Family." With his characterstic wit and wisdom, Chesterton brilliantly critiques writers such as Rudyard Kipling, G B Shaw, and H G Wells, whose views are still influential today. About "Heretics (Authentic Digital Classics Series)"
Gilbert Keith Chesterton was born in London, England, in 1874. He went on to study art at the Slade School, and literature at University College in London. Chesterton wrote a great deal of poetry, as well as works of social and literary criticism. Among his most notable books are The Man Who Was Thursday, a metaphysical thriller, and The Everlasting Man, a history of humankind's spiritual progress. After Chesterton converted to Catholicism in 1922, he wrote mainly on religious topics such as Orthodoxy and Heretics. Chesterton is most known for creating the famous priest-detective character Father Brown, who first appeared in The Innocence of Father Brown. Chesterton died in 1936 at the age of 62. This book brings together a diverse selection of newspaper essays by celebrated author G K Chesterton (1874-1936), written before World War I. This is a sampling of Chesterton at his brilliant best, tackling politics, literature, the ups and downs of daily life, and much more - all of it displaying his robust "uncommon sense", his lively intellect, and his profound Christian faith. Martin Luther's core teachings on justification by faith alone are particularly well exemplified in his classic commentary on Galatians. In this pivotal work, we see Luther at his most compelling, mapping out the relationship between law and grace. Essential reading for anyone who wants to understand the fundamentals of Protestant conviction. "Spirituality involves taking our personal experience seriously as raw material for redemption and holiness, examining the material of our daily lives with as much rigor as we do Scripture and doctrine. Confessions is the landmark work in this exercise." Saint Augustine wasn't always a saint. He led a turbulent and licentious youth, and belonged to the fourth century equivalent of a street gang. At the age of 29, he met a young man, Ambrose, whose intelligence, kindness and strong faith fascinated and puzzled Augustine. Then at the age of thirty-two, under Ambrose's tutelage, Augustine converted to Christianity and went on to be one of the most influential Christians throughout history. Written in 400 AD, less than a decade after his ordination to the priesthood, a mere four years after becoming bishop of Hippo, he wrote Confessions in his forties. He was a man looking back and looking forward, an apt simile perhaps for the role Augustine played in the history of the Church, that of a bridge between two distinct eras. Confessions traces a pilgrimage of unbounded grace, passionately wrestling with the spiritual questions that have engaged thoughtful minds since time began. It is Augustine's utter candor about his own sin and his struggle to reconcile his mind and soul to God's holy character that made Confessions the classic that it has been for fifteen centuries and compelling to readers still today. "It is difficult to find a theologian - from any age - who has not been influenced by the teachings of St. Augustine."